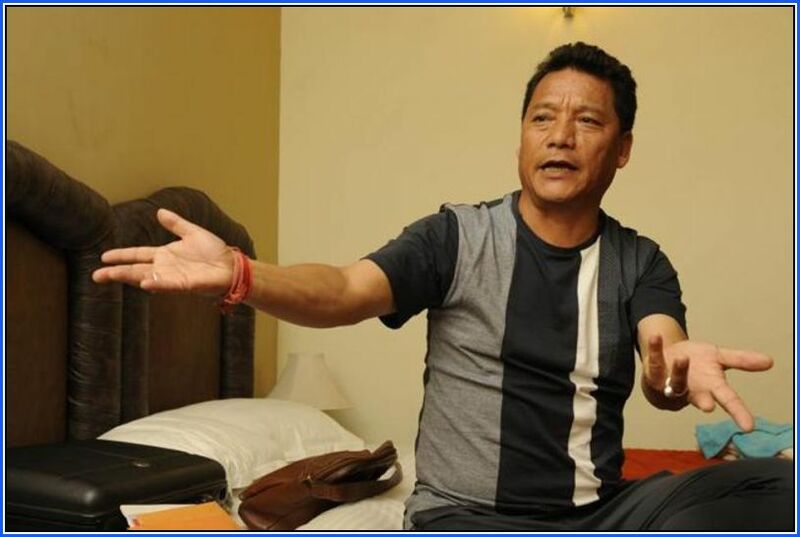 Fugitive leader of Gorkha Janmukti Morcha (GJM), Bimal Gurung, who still calls the shot in the politics of Darjeeling and surrounding areas, is desperately trying to return to Darjeeling and participate in the Lok Sabha election and help BJP candidate Raju Bista. Bimal Gurung has 30 criminal cases, including UAPA, slapped against him by the government. These were registered in the aftermath of the 105-day strike in June 2017. The strike had turned violent. Gurung has been on the run for the past two years. He had petitioned the Supreme Court to allow him to participate in the elections but the Supreme Court said it wants to know the status and number of cases against him. Bimal Gurung says he wants to defeat the Trinamool Congress candidate, Amar Singh Rai-- a GJM MLA, made to contest in Trinamool Congress ticket. Here is an excerpt from India Today TV's exclusive interview with Bimal Gurung. Question: Is BJP candidate Raju Bista your candidate too? Bimal Gurung: He is a GJM-GNLF-BJP candidate for the Darjeeling Lok Sabha seat. (GNLF had been an arch rival of the GJM. But at present, both the parties have joined hands to defeat the Trinamool Congress (TMC)). What will be your role in 2019 Lok Sabha elections? My role will be that of a guardian and elder brother to guide the future generation of the Gorkhas towards what's best for our community. Given the strategic location of Darjeeling, Terai and Dooars, we need a party with proven nationalistic credentials to win here. As you are aware, TMC has allowed Rohingya to settle down here and if they win in the Lok Sabha polls, it will jeopardise our national security. I will tell my people to vote in the interest of our nation, region and community. The state has appointed Binay Tamang and Anik Thapa as the head of the GTA and they are claiming themselves to be the real GJM. How can you mobilise voters being in the hideout? A hyena can claim to be a tiger all it wants, but at the end it remains a filthy animal surviving on carcasses, same is the case with two. They [Binay Tamang and Anik Thapa] can mobilise only those people whom they were able to threaten with false cases. But majority see them as traitors to the cause of Gorkhaland and are not with them. Will you campaign? If yes, when? I don't need to do door-to-door campaigning. Right now I am busy devising the campaign strategies and coordinating with grassroots workers. I may address a few rallies but I will take a call when the need arises. Why are you supporting the BJP? Was BJP MP SS Ahluwalia of no help when the three-month-old strike hit Darjeeling? BJP is a party with proven nationalistic credentials and has a track record of creating smaller states. This is the most democratic party in the country where a chaiwala can become the prime minister. I have firm belief that BJP will fulfill our demand. Ahluwalia ji might not have been in the press box talking to you but he was always with us. He is someone who prefers working away from the limelight. What are the conditions you have set for BJP and Narendra Modi? (Laughs) You are making it sound like a business negotiation. They are considerate about our demand and we are confident that with a majority, in both Lok Sabha and Rajya Sabha, they will see fulfil our demands, either by giving our region a constitutionally guaranteed autonomy, be it in the form of a state or a Union territory. Why did your MLA Amar Singh Rai decide to contest as TMC candidate? What was the provocation? Money and desperate need to be recognised as someone important in the society. He is sold off. A GNLF leader has been arrested for campaigning for BJP. Will you be able to mobilise your party to campaign in this scenario? There has been an illegal arrest of a tea garden trade union leader JB Tamang as soon as GNLF announced alliance with us. The reason why we are opposing TMC is because of this fascist attitude against people who don't agree with them. An undeclared emergency is reigning in the region. Our freedom of speech and fundamental rights are being curtailed. We will mobilise our people and will campaign and will always stand up against dictatorship. Things seem to be peaceful in the hills. Are the hills smiling? Peace in the hills is like the peace in a graveyard. Other than the living dead no one is happy. But let me tell you Darjeeling, Terai and Dooars won't just smile but will laugh after TMC and its stooges are defeated in the election.